Many of our newest viewers are asking themselves this question, but we do want you to make the most informed decision possible. Let us help you. Dreads are a commitment. Maybe even more so than just your impulsive haircut, but don’t worry. They are still totally awesome. 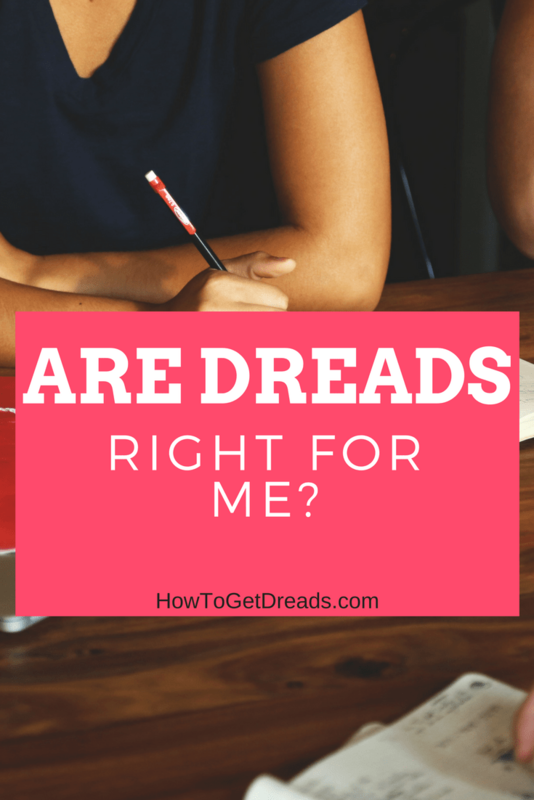 There are a few bits of advice on how to determine whether or not dreads are something you really are ready for. Doing your research ahead of time is going to be invaluable. Look into each and every story you can read: the good, the bad, and the ugly. This will give you the most realistic representation of the dread community. There will be a lot more successes than failures, but the failures teach us valuable lessons. Take some time to research and really add up the products and tools you will need. There will be a lot of sites that tell you that you need fifteen different items and some sites that tell you that only two main items are required, either way, you will need some tools and products to keep your dreads healthy and intact. Just be prepared for that. Dreads require a lot of care. There are tons of helpful videos, blog posts (like this one), and podcast on care and maintenance. It all comes down to your personal preferences and how much you care about your hair. There will be times that you will need to do more maintenance than others. It’s not something to skip out on. If you don’t take care of them and maintain them then a dreaded failure will ensue and no one wants that. With dreads, there’s no “ah-ha” moment. It’s a journey, that’s why everyone calls it their “Dread Journey.” There are no instant results with dreadlocks. Of course, you will definitely look different right away but with patience, persistence, and the right products, your dreads will turn out amazingly. Dreads take time to evolve. They will shrink, break, fray, stretch, loosen, knot and every other adjective that hair is capable of. You are changing the composition of your hair from what it has been for so long. It’s like working out. You can’t expect to look the way you want right away, but with time and consistency, everything will start to take shape. Getting dreads is a transformation in more ways than one. It will obviously transform your look. It will look AWESOME but it will look very different to you at first. It’s sometimes shocking, eye-opening, and dumbfounding how dreads look initially to their new owners. Your lifestyle will change as well. Almost always for the good, but there will be some lifestyle changes that come with dreads. You might shower less, save money on silly products and styling tools, but you need to maintain them a few times a week, purchase different products to help them knot, and on and on. Just because you get dreads doesn’t mean your life becomes magically easier without having to do your hair. Now, it does in some sense, but that doesn’t come for a while. Your hair is also going through a transformation. It’s confused, knotted, and still trying to grow the same way it has been your whole life. You will need to guide it and re-train it how you want to go. Your hair will react in many different ways to dreads and over the course of months or even years, you will begin to get your desired look. If you haven’t figured it out, dreads are awesome but they are something that needs to be planned. There are some glaring roadblocks often in our way to starting dreads and these are still important factors to consider. Big investments like getting dreads can last a long time. As long as you want them, really. However, with a big investment, removing or combing them out is a process and very difficult to do if you don’t want to go bald. You don’t want to spend the time and money getting your set of dreads just to get them removed a few months later before they look the way they are supposed to. Finally, as much as we all want (and need) this to change a.s.a.p., there are still going to be misconceptions, stereotypes, and ridiculous questions that you will have to endure when you make the commitment to dreads. Ignorance and misinformation run rampant in those who don’t like the dreaded look and they also have a hard time keeping their opinions to themselves. As the dreaded masterpieces we are, we just nod, throw a dread over our shoulder, and smile. Dreading is a journey and a transformation. Being educated and learning everything you can, will give you the best experience possible and will get you best prepared for getting dreadlocks.